This month Russian scientists announced in the journal Doklady Biological Sciences that they discovered very old nematode worms. 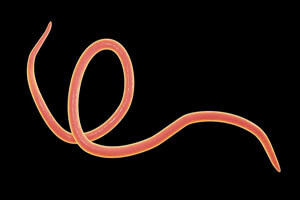 More commonly known as roundworms, they are thought to be at least 32,000 years old. They were buried in permafrost and resurrected themselves after being discovered and thawed out. If the discovery is verified it would be the longest-surviving multi-celled organism that has ever been discovered. It would dwarf the the tardigrade, which can survive in extreme conditions for up to 5 years. Gizmodo is reporting that the worms were taken from frozen soil in the Kolyma River Lowlands in northeastern Siberia. Over 300 frozen soil samples were extracted. Of these, 2 samples contained roundworms. One sample dated around 32,000 years old. The other, around 40,000 years old. The worms were warmed to 20 degrees Celsius (68 F) and kept in petri dishes that contained food. The Russian scientists then began to spot flickers of life. The worms started eating the food and then began breeding. Child worms were removed, grown separately, and they too survived and thrived. The team of scientists claims they maintained a very strict sterile environment. But contamination cannot be dismissed out of hand. The find needs to be verified. The team of researchers argues that it would be impossible for today’s worms to burrow their way through the permafrost and into the ice samples that were extracted. One sample was 100 feet down, the other, 15 feet down. Living organisms have been revived after prolonged cryogenic hibernation in the past. Roundworms have been known to survive for at least 39 years in previous study after being dormant. In another study, scientists extracted spores from bacillus bacteria that were hidden inside 250 million-year-old salt crystals. Scientists were able to revive the bacteria and bring them back to life. However this recent find is very unique. Nematode worms are much more advanced, on a cellular level, than bacteria. And 32,000 years is a lot longer than 39 years, when comparing them to dormant roundworms found in the past. It’s a find on a much more massive scale. Some scientists are concerned that by reviving ancient organisms we run the risk of unleashing new pathogens that have been buried for tens of thousands of years. There’s no indication that these worms contained any harmful pathogens, but some scientists believe we should be very cautious when dealing with ancient life forms.